Temple Allen makes Surface Preparation Solutions. These solutions are innovative mechanical systems which support the artisan and address a wide variety of surface preparation processes - each of which brings its own set of challenges. Temple Allen wants to solve those challenges. For a detailed look at how we approach surface preparation, please see our brochure: Our Approach to Surface Preparation. Temple Allen solutions are available to address both horizontal and vertical surfaces, oriented above the artisan’s head, below their feet, or in front of them. Learn more about our deployment options with this brochure: Deployment Configurations. 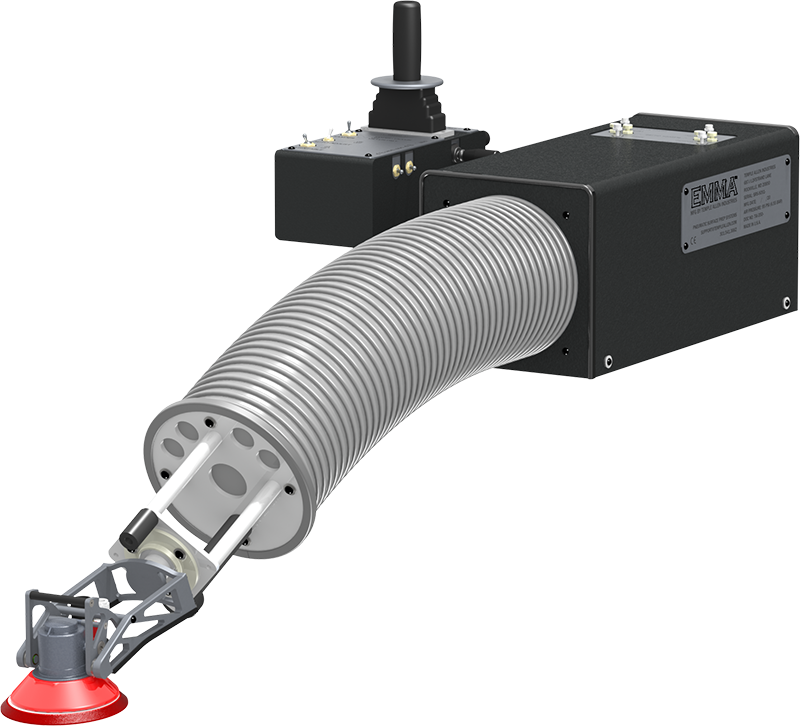 EMMA™ (Easily Manipulated Mechanical Arm) is a 100% pneumatic mechanical arm used to deploy a variety of sanding, grinding, or polishing tools. Each EMMA Model features the same core technology, the EMMA Module, which includes the Arm, Joystick Box, Actuation Package, and Auto-Adjust. Together, the EMMA Module allows each EMMA System to fully bear the weight of the tool, absorb vibrations, and apply a consistent and user-adjustable contact pressure to the part surface. Each EMMA Model also includes a unique deployment system to effectively and efficiently present the EMMA module to part surface, thus allowing EMMA to be used on parts in a variety of facilities in a range of sizes and orientations. SAM™ (Standup Abrading Machine) is a 100% pneumatic system used to deploy a wide range of abrading tools, from sanders to grinders to scalers. All SAM systems* incorporate the same vibration-reducing technology first developed for our EMMA™ products positioned in-line with an ergonomic handle designed to best position the artisan and the End-Effector for a given application.